Objective The objective was to investigate the short-term risk of major adverse cardiovascular events (MACEs) or congestive heart failure (CHF) in patients with psoriatic arthritis (PsA) or psoriasis initiating a biological therapy. Methods Screening for the study was carried out using MEDLINE, Cochrane and Embase, from the inception of the database to December 2017. Randomised controlled trials (RCTs) of anti-tumour necrosis factor (TNF), anti-interleukin (IL)12/23, anti-IL23 and anti-IL17 agents for the treatment of PsA or psoriasis were included. Two investigators independently extracted MACEs or CHF data reported during the placebo-controlled phase. The primary outcome measures were the incidence of MACEs or CHF. Results Of 753 references screened, 62 articles were selected, and 12 articles were added by manual searches. Accordingly 77 RCTs were included in the meta-analysis (MA) (10 174 patient-years (P-Y)). No significant difference was observed in MACE incidences in patients receiving anti-TNF, anti-IL12/23, anti-IL23 or anti-IL17 agents in comparison to the placebo. However, 10 MACEs were observed in the anti-IL12/23 group (1150 P-Y) compared with 1 in the placebo group (652 P-Y), with 0.01 −0.00 to 0.02 event/P-Y risk difference, which is not statistically significant. This trend was not observed in the anti-IL23 group. No significant difference was observed in CHF incidence in patients receiving biological agents in comparison to placebo. Conclusion This MA of 77 RCTs did not reveal any significant change in the short-term risk of MACE or CHF in patients with PsA or psoriasis initiating a biological therapy. Both psoriatic arthritis (PsA) and psoriasis have been associated with an increased prevalence of systemic and vascular inflammation and clinical atherosclerosis. Biological therapies, approved for the treatment of PsA or psoriasis, have demonstrated anti-inflammatory effects. They could theoretically prevent atherosclerosis and therefore decrease the long-term risk of cardiovascular diseases. This meta-analysis did not reveal any significant change in the risk of major adverse cardiovascular events or congestive heart failure in patients with PsA or psoriasis initiating biological therapy. How might this impact on clinical pratice? In a short-term perspective, the results should reassure the physicians about the cardiovascular safety of biological therapies. In a long-term perspective, studies involving a larger number of patients as well as a longer duration of treatment exposure are needed to evaluate the impact of biological therapies on the cardiovascular risk of patients with PsA or psoriasis. The objective of this systematic review and MA of randomised controlled trials (RCTs) was to investigate the short-term risk of MACEs or congestive heart failure (CHF) in patients with PsA or psoriasis initiating a biological therapy. This MA was performed on RCTs from MEDLINE (PubMed), Cochrane and EMBASE data bases. We restricted the searches to the English language. All RCTs on anti-tumor necrosis factor (anti-TNF), anti-interleukin IL12/23, anti-IL23 and anti-IL17 agents used in the treatment of PsA, chronic plaque and pustuloplantar psoriasis were reviewed. Manual searches in American college of Rheumatology (ACR), European League Against Rheumatism (EULAR), American Academy of Dermatology (AAD) and Psoriasis Gene to Clinic (PGC) abstract archives were included in the review. The searches were conducted using the following key words: (“Psoriasis” OR “Arthritis, Psoriatic”) AND (“Adalimumab” OR “Certolizumab” OR “Etanercept” OR “Golimumab” OR “Infliximab” OR “Briakinumab” OR “Ustekinumab” OR “Guselkumab” OR “Risankizumab” OR “Tildrakizumab” OR “Brodalumab” OR “Ixekizumab” OR “Secukinumab”). On the EMBASE and Cochrane data bases, the searches were restricted to “trials”. On PubMed, we restricted the research to “clinical trials”. On Cochrane data base, the selection of studies was restricted to the same key words, using (“Stroke” OR “Cardiovascular diseases”) in addition. We included studies from the inception of the data base to December 2017.All the randomised, placebo-controlled, double-blind studies, that assess the efficacy and safety of anti-TNF, anti-IL12/23, anti-IL23 or anti-IL17 agents in adult patients with PsA and/or psoriasis were included if safety data concerning MACEs (defined as myocardial infarction, stroke or CV death) or CHF (defined as global cardiac failure with signs of right and left cardiac decompensation) were available. Two authors (BC and ArC) separately screened titles and article abstracts and reviewed all the safety data on MACEs or CHF in selected articles. Study design/characteristics: study design, trial duration. Patient characteristics: number of patients in each arm, age, gender ratio, disease duration, proportion of patients with PsA, baseline Psoriasis Area and Severity Index score and baseline body surface area score. Intervention: treatment arm (biological therapy or placebo). 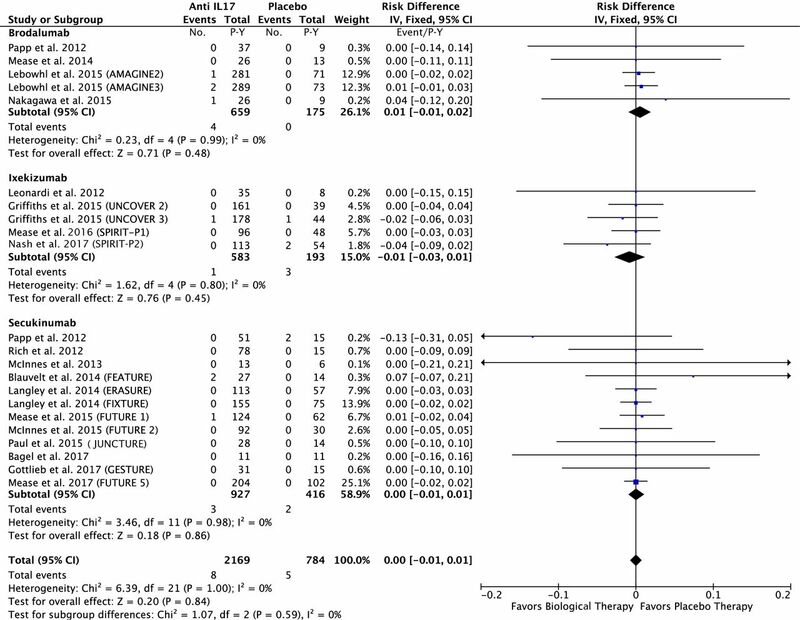 Primary outcomes: number of MACEs or CHF in each arm during the placebo-controlled phase. To take into consideration the duration of the placebo-controlled phase and the number of patients in each arm, the results were expressed in patient-year (P-Y) in the biological group and the control group to enable the comparison between RCTs. The Jadad Scale was used for quality assessment for RCTs. Primary outcome measures were the incidence of MACEs or CHF during the placebo-controlled phase of biological treatment. We included all the events that occurred in patients who received at least 1 dose of study agent or placebo. MACEs or CHF that occurred during the follow-up open-label period were not considered. The results of each selected study were presented as risk differences with a 95% CI. This MA was carried out using the inverse variance method whereby estimates of each study were pooling using a fixed or random effects model according to the level and significance of heterogeneity. Heterogeneity was tested with Cochran’s Q-test and evaluated by I2 statistic with the following classification: 0% to 30% indicated negligible heterogeneity, 30% to 50% moderate heterogeneity, 50% to 75% substantial heterogeneity and high heterogeneity for values above 75%. For the Q-test, a p value less than 0.10 was considered as significant, and a random-effects model was used. Analysis involved use of RevMan V.5.3 (The Nordic Cochrane Centre, The Cochrane Collaboration, 2011) for the MA calculations. P values less than 0.05 were considered statistically significant. About 753 references met the selection criteria for this MA, which was carried out until December 2017. Finally, 62 articles met the inclusion criteria, and 12 articles were added after manual searches. The details of the selection process are available in the flow chart (eg, figure 1). Flow chart of studies included in the MA. 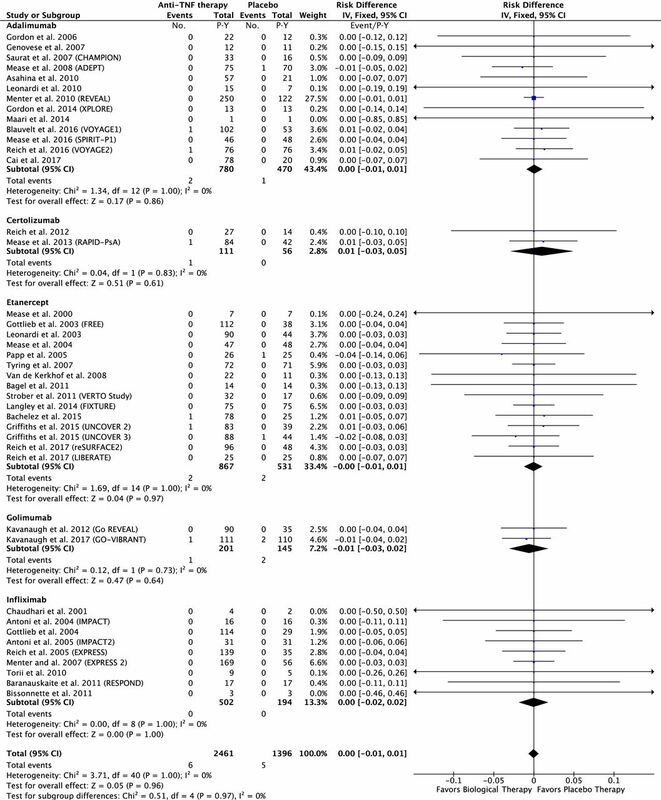 MA, meta-analysis; RCT, randomised controlled trial. The CV safety data were extracted from 74 articles, corresponding to 77 RCTs14–86 (3 articles that investigated safety data in 2 RCTs). The summary of the RCTs included in the MA is presented in (eg, (online supplementary table 1)). The main baseline characteristics of patients included in the RCTs selected for this MA are summarised in (eg, (online supplementary table 2)). The JADAD Scale for each RCT is presented in (eg, (online supplementary table 3)). In the anti-TNF group: 6 of the 2461 P-Y in the anti-TNF group and 5 of the 1396 P-Y in the placebo group had a MACE. The risk difference was 0.00; 95% CI −0.01 to 0.01 event/P-Y; p=0.96 (figure 2). In the anti-IL12/23 group: 10 of the 1150 P-Y in the anti-IL12/23 and 1 of the 652 P-Y in the placebo group had a MACE. The risk difference was 0.01; 95% CI −0.00 to 0.02 event/P-Y; p=0.21 (figure 3). In the anti-IL23 group: 4 of the 1188 P-Y in the anti-IL23 and 1 of the 374 P-Y in the placebo group had a MACE. The risk difference was 0.00; 95% CI −0.01 to 0.01 event/P-Y; p=0.77 (figure 4). In the anti-IL17 group: 8 of the 2169 P-Y of the anti-TNF group and 5 of the 784 P-Y in the placebo group had a MACE. The risk difference was −0.00; 95% CI −0.01 to 0.01 event/P-Y; p=0.84 (eg, figure 5). 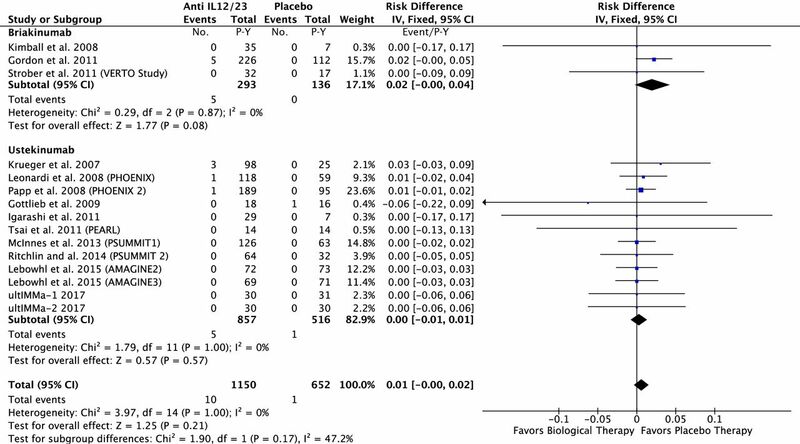 Difference in the risk of MACEs in patients treated with anti-TNF agents compared with the placebo in RCTs. MACEs, major adverse cardiovascular events; RCTs, randomised controlled trials; TNF, tumour necrosis factor. Difference in the risk of MACEs in patients treated with anti-IL12/23 agents compared with the placebo in RCTs. IL, interleukin; MACEs, major adverse cardiovascular events; RCTs, randomised controlled trials. 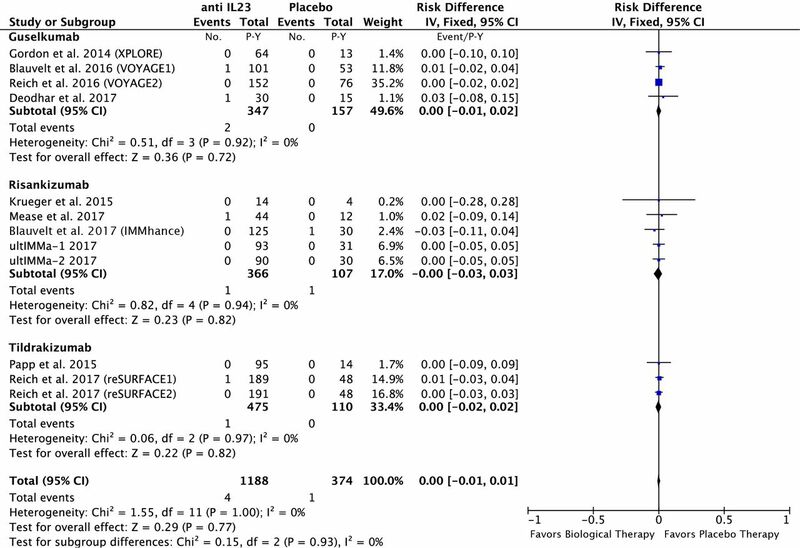 Difference in the risk of MACEs in patients treated with anti-IL23 agents compared with the placebo in RCTs. IL, interleukin; MACEs, major adverse cardiovascular events; RCTs, randomised controlled trials. Difference in the risk of MACEs in patients treated with anti–IL17 agents compared with the placebo in RCTs. IL,interleukin; MACEs, major adverse cardiovascular events; RCTs, randomised controlled trials. In the anti-TNF group: 0 of the 2461 P-Y in anti-TNF group and 0 of the 1396 P-Y in the placebo group had a CHF. The risk difference was 0.00; 95% CI −0.01 to 0.01 event/P-Y; p>0.99(eg, (online supplementary figure 6)). In the anti-IL12/23 group: 0 of the 1150 P-Y in the anti-IL12/23 and 1 of 652 P-Y in the placebo group had a CHF. The risk difference was −0.00; 95% CI −0.01 to 0.01 event/P-Y; p=0.98 (eg, (online supplementary figure 7)). In the anti-IL23 group: 0 of the 1188 P-Y in the anti-IL23 and 0 of 374 P-Y in the placebo group had a CHF. The risk difference was 0.00; 95% CI −0.01 to 0.01 event/P-Y; p>0.99 (eg, (online supplementary figure 8)). In the anti-IL17 group: 1 of the 2169 P-Y of the anti-TNF group and 0 of the 784 P-Y in the placebo group had a CHF. The risk difference was 0.00; 95% CI −0.01 to 0.01 event/P-Y; p=0.99 (eg, (online supplementary figure 9)). In this MA of RCTs, there was no significant change in the short-term risk of MACEs or CHF in patients with PsA or psoriasis initiating a biological therapy such as anti-TNF, anti-IL12/23, anti-IL23 or anti-17 compared with the placebo. However, there was a trend for an increased risk of MACEs in patients exposed to anti-IL12/23. Our MA showed no statistically significant difference in the short-term risk of MACEs in patients with PsA or psoriasis initiating a biological therapy. Our results are consistent with those of the first and fourth MA, but differ from those of the second MA,87 which showed a statistically significant increase in the rate of MACEs in patients who received anti-IL12/23 therapies. Differences in methods of statistical analysis used to calculate the risk of MACE could explain these discordant results. Our MA was carried out using the inverse variance method while the MA by Tzellos et al 87 used the Peto OR method which indicates that trials with no events in both arms were automatically given zero weight and excluded from the analysis.88 89 Several methodological issues explain the discordant results between our MA and the MA by Roubille et al 13 which included a few observational studies and both conventional synthetic and biological therapies. However, even though our MA shows no statistically significant difference in terms of MACE incidence in patients receiving anti-IL12/23 biological Disease Modifying AntiRheumatic Drug (DMARDs) in comparison to the placebo, we observed a trend of increased risk of MACEs in patients initiating a treatment with briakinumab and to a lesser extent with ustekinumab in comparison to the placebo. It is interesting to note that briakinumab was withdrawn from further clinical development in 2011 because MACE were reported during phase II and phase III clinical trials in subjects with psoriasis.12 Further randomised trials involving bDMARDs targeting IL12/23 pathway could increase the number of events in treated patients compared with placebo and then improve the power of the statistical test. If this trend was confirmed in further studies, the observed difference might become statistically significant in future MA. No increase in the risk of MACEs was observed in the anti-IL23 (guselkumab, risankizumab and tildrakizumab) group compared with the placebo group in our MA. Our MA shows no statistically significant difference in the short-term risk of CHF in patients with PsA or psoriasis initiating a biological therapy. No previous MA has assessed the short-term risk of CHF at the initiation of biological therapies in patients with PsA or psoriasis. Several limitations should be considered when interpreting the findings of our MA. First, MACEs were not clearly defined in all the RCTs. Second, the short duration of the placebo-controlled phase of the RCTs only enabled a short-term evaluation of the impact of biological therapies on the risk of MACEs or CHF. Third, the non-inclusion criteria of RCTs usually excluded patients at high risk of MACEs and CHF. Our MA, which is focused on the placebo-controlled phase of RCTs, did not reveal any significant change in the short-term risk of MACEs or CHF in patients with PsA or psoriasis initiating an anti-TNF, anti-IL12/23, anti-IL23 or anti-IL17 agent in comparison to the placebo. Data from the long-term extension phases of these RCTs and from the long-term follow-up of patients with PsA and psoriasis included in biological therapy registries are required to further characterise the long-term impact of biological therapies on the risk of MACEs or CHF. We are grateful to the professors and organisers of ASLER seminary (for Systematic Analysis of the Litterature in Rheumatology) for their useful advice in the writing of this manuscript. We wish to thank AbbVie who provided logistic support in the organisation of sessions about the implementation of meta-analysis and remained independent of the collection, analysis and interpretation of data. We are grateful to Mrs Weill C. who helped us in the EMBASE bibliographic research.
. Safety and efficacy of adalimumab in treatment of patients with psoriatic arthritis who had failed disease modifying antirheumatic drug therapy. J Rheumatol 2007;34:1040–50.
. Safety and efficacy of apremilast through 104 weeks in patients with moderate to severe psoriasis who continued on apremilast or switched from etanercept treatment in the LIBERATE study. J Am Acad Dermatol 2017;76:AB224.
. ultIMMa-1 AbbVie. Data on File, RRTI65191, NCT.
. ultIMMa-2 AbbVie. Data on File, RRTI65192, NCT.
. Efficacy and safety results of guselkumab in patients with active psoriatic arthritis over 56 weeks from a phase 2a, randomized, double-blind, placebo-controlled study [abstract]. Arthritis Rheumatol 2017;69(suppl 10).
. Efficacy and safety results from a phase 2 trial of risankizumab, a selective IL- 23p19 inhibitor, in patients with active psoriatic arthritis [abstract]. Arthritis Rheumatol 2017;69(suppl 10).
. Efficacy and safety of risankizumab, an interleukin-23 inhibitor, in patients with moderate-to-severe chronic plaque psoriasis: 16-week results from the phase III IMMhance trial. Br J Dermatol 2017;177:e248.
. Subcutaneous secukinumab inhibits radiographic progression in psoriatic arthritis: primary results from a large randomized, controlled, double-blind phase 3 study [abstract]. Arthritis Rheumatol 2017;69(suppl 10).
. Cardiovascular event risk assessment in psoriasis patients treated with tumor necrosis factor-α inhibitors versus methotrexate. J Am Acad Dermatol. janv 2017;76:81–90. Contributors BC, ArC: contributed to the conception of the study, the article selection process, the data collection, the data analysis, the results interpretation and the manuscript writing and approval. AR-W: contributed to the conception of the study, results interpretation and manuscript writing and approval. YD, AC: contributed to the conception of the study, results interpretation and manuscript approval. TB: was in charge of the statistical analyses. All authors take responsibility for the integrity of the work as a whole, from inception to published article, and they should indicate that they had full access to all the data in the study and take responsibility for the integrity of the data and the accuracy of the data analysis. They give permission to reproduce published material, report sensitive personal information, to use illustrations of identifiable persons or to name persons for their contributions. 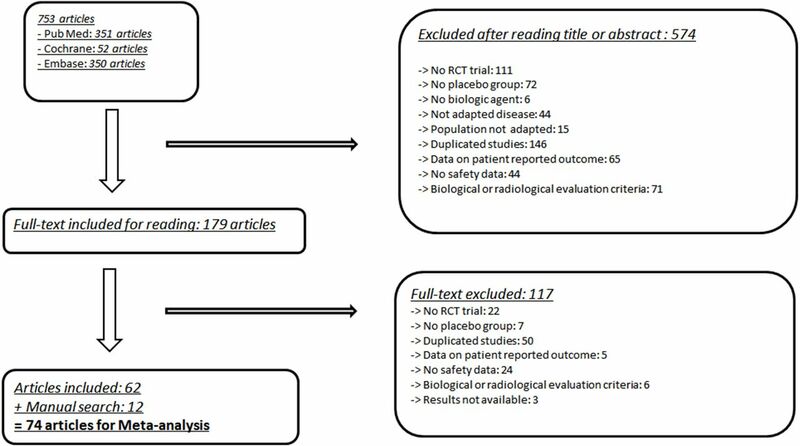 Ethics approval The ethics committee approvals of each trial were obtained for all the studies selected in this meta-analysis. Data sharing statement This study involved only published reports and none unpublished information. No database was used for this study.